This is the first time I've ever done this. I combined two separate challenges and made one layout. The first challenge was from The Studio Challenges Blog. 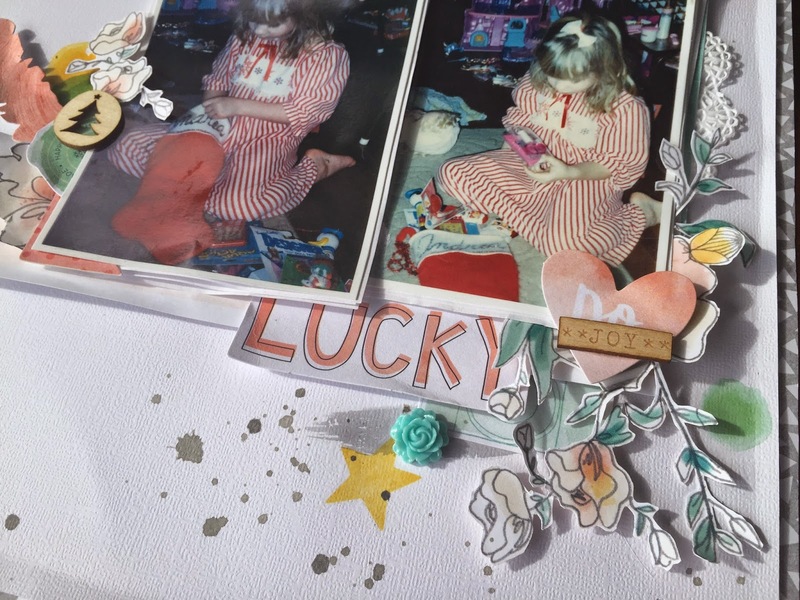 The Challenge is "Childhood Memories" which meant to find an old childhood photo with a story behind it. This sketch is totally "me". It has a lot of white space, tight layers, and tons of room for embellishing. As you can see, I stuck pretty closely with the sketch. I added a few additional layers to create more dimension and crammed in a bunch of embellishments including: rub-ons, emphera, wood veneer, stamping, doilies, puffy stickers, resin stars, and gray ink splatters. #1: The pajamas: My mom always picked out the most festive Christmas PJ's which we opened Christmas Eve Night. It was always something I looked forward to as a child, and she actually did this up until I moved out of the house in my 20's. I try and pass on this tradition to my son every year. #2 The stocking: "Santa" was the King when it came to my family's stocking stuffers. We always had candy and little gifts wrapped up individually like: lotions, toothbrushes, toothpaste, nail files, make-up, little toys, PEZ dispensers, and basically anything that would fit in the stocking. I also try to pass this tradition on to my son and his christmas stocking. Want are some of your childhood memories that you pass on in your life today? This is gorgeous! Love your perfect colour combo and fab embellishing! So glad you joined us at Stuck?! Thank you, Laura. It was such a fun sketch to work with. Love all your layering and embellishing! Love your story of your childhood memories as well. Thanks for playing along with Stuck?! Thanks for the sweet compliments, Sandy. This is beautiful, love all the layering! Thanks for joining us at Stuck?! This is simply stunning! So serene, and I just adore the simplicity of it! Thanks so much for playing along with us at Stuck?! Sketches! Thanks Jinny. It was a great sketch! 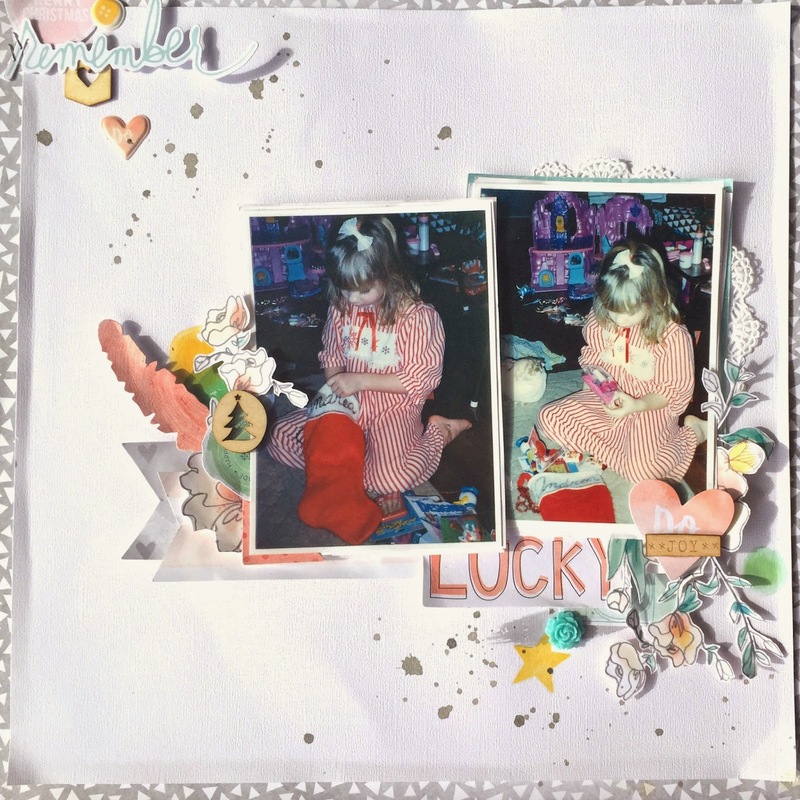 What a lovely layout, love the white space with all those embellishments! Lovely stories behind the photos too. Thanks so much for joining in with us at The Studio Challenges! Elegant LO! I love the watercolor effect. Happy new year! Thanks for joining us at The Studio Challenges. I totally missed that this was for our challenge in The Studio, too, the last time I was here. Just as beautiful as the first time I saw it! Thanks so much for playing along with us in The Studio!